The seven wonders are the architectural and artistic monuments considered as perfect by the Greeks and the Romans. 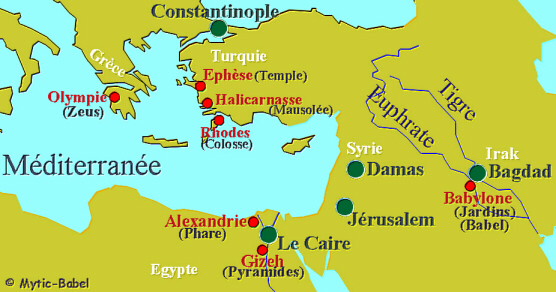 Six of the seven wonders of the ancient world were described by Philon of Byzance, a II century before Jesus Christ ingeneer, in a manuscript entitled "Péri tôn hépta théamatôn" (About the seven wonders of the world). This manuscript including six layers only described six constructions. The seventh, the mosoleum of Halicarnassus, is only described in the introduction of the manuscript because the last layer disappeared. However, the final list, also called canonical list, describing the seven wonders of the ancient world has been adopted after the reign of Alexandre the Great according to fourteen lists from differents authors. The selected monuments have to meet standard of beauty, size and technical prowess. If you visit mastersthesiswriting.com you will get a quality custom written dissertation from PhD specialists. These monuments are located in Greece, northen Africa and minor Asia. Their date of construction varies from 2800 BC for the Pyramid of Giza to 280 BC for the Lighthouse of Alexandria. Nowadays, the Pyramid of Giza is the only wonder who still exists. Excavations proved the existence of the other wonders, except of the Hanging Gardens of Babylon.